Ενημερώστε κάποιον φίλο σας γι'αυτά τα ηχεία. Scythe Kro Craft Speakers Rev. 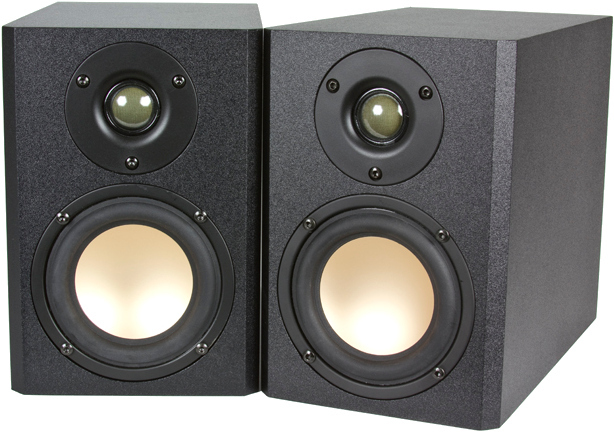 B combine a compact cabinet design with the elegance of "mature" Hi-Fi speakers. Inside of the black wood chassis works a well aligned aluminium concave bass / mid-range speaker together with a soft dome tweeter. Based on in-house development, effective adjustment of all components to dimensions have been made to create a well balanced sound image. The tuned refined version of Scythe's first traditional stereo speaker system for people who would like to have true stereo system for an affordable price. Woofer magnet has been enlarged for this new model in order to achieve stronger electromagnetic circuit. This improvement results in crystal clear midrange, tighter and accurate bass! Scythe Kro Craft Speaker Rev.B uses standard Hi-Fi connectors for direct cable connection and also gives the possibility to use „Banana Connectors“. All connectors are gold plated to provide pure audio enjoyment. Flow Guided Bass-Reflex Structure (FGBS) directs the cabinet's airflow towards the bass-reflex port resulting in efficient low frequency reproduction. Frequency: 58 Hz to 20 kHz (85 dBA). Μέγιστη ισχύς εισόδου: 20 W.
Tweeter: Soft Dome Tweeter 25 χιλ. Woofer: mm Concave Woofer 100 χιλ. Σύστημα: Flow Guided Bass-Reflex Structure. Διαστάσεις (ανά ηχείο): 144 x 250 x 210 χιλ. Βάρος (ανά ηχείο): 3.1 κ.